Before reading this chapter, share with your friends what you already know about the changes that have been made in celebrating the Eucharist in your lifetime. How do you think the Eucharist might have been celebrated in the early Church? The disciples were devastated at the death of Jesus but were greatly comforted and encouraged by his appearances after his resurrection when he ate and drank with them. I like to think Jesus was teaching them that when they had a meal together to remember him – then he was with them as the risen Christ. The Last Supper was probably a rather bewildering event for the disciples and there was little time to reflect on it as it was followed immediately by his betrayal, suffering and death. When he revealed himself in the ‘breaking of bread’ to the two disciples at Emmaus (Luke 24:13–35) and when he provided a barbecued breakfast of bread and fish for the disciples on the shores of Lake Galilee (John 21:1–14), perhaps he was teaching them in a very visual way that when they had a meal in memory of him, then he would be with them as the Risen One. What provoked the disciples to begin celebrating a meal in memory of Jesus is a ‘missing link’ in the history of the Eucharist in the early Church. Paul in 1 Corinthians 11 and Matthew, Mark and Luke in their gospels tell us about the institution of the Eucharist at the Last Supper. These accounts were written 25 to 60 years after the event, during which time what actually happened would have been partly lost and each community remembered the event in the way it had been passed on to them. It would be natural for the authors to write into their story of the Last Supper the way the Eucharist was celebrated by the communities at the time of writing. We would like to know the details of the early Eucharists but, alas, the writers have not provided them. The earliest Eucharists were home Masses (Acts 2:46 says ‘they broke bread at home’) with small numbers and one could safely presume they would have been very simple. Elaborate ceremonies would develop only later. Yet these early Eucharists were establishing the traditions or should we say ‘Traditions’ with a capital ‘T’. When we want to be truly ‘traditional’, we are looking not at the Church of the 1950s or the Middle Ages but at the very early Church of the first few centuries. This is the only account we have in the New Testament of a specific celebration of the Eucharist, and again it gives no details. Note that they met ‘on the first day of the week’, that is, Sunday, the day of the resurrection, so these early Christians changed the day of meeting from Saturday, the Jewish Sabbath, to Sunday. Each community would have developed its own way of celebrating the Eucharist and for this reason we cannot generalise about how the ritual was performed. At least in some places such as Corinth, the Eucharist, here referred to as ‘the Lord’s Supper’, was celebrated together with a community meal. We know this because Paul rebukes the community there for not sharing their food as they should. Paul is quite severe towards the Corinthians and he asks them to recall how Jesus gave himself so unselfishly when he instituted the Eucharist at the Last Supper. He repeats for them the words that Jesus used: ‘This is my body that is for you…’ Paul then tells them that when they do not share generously they are eating and drinking ‘in an unworthy manner’ (v. 27) and not ‘discerning the body’ (v. 29), that is, the assembly of followers. Sharing a meal at the same time as celebrating the Eucharist fell out of use, though it seems a natural thing to do, and many parishes today have morning tea after Sunday morning Mass. At our Life In The Eucharist (LITE) programs we always conclude with a Mass followed immediately by a meal, to which everyone brings something to share. We call this agape or love feast as the Corinthians did. 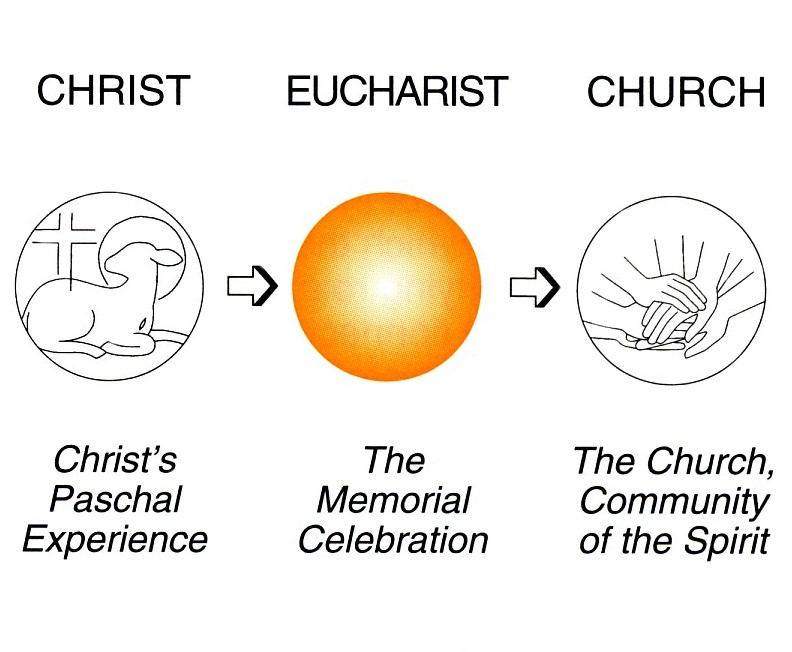 The particular way of celebrating the Eucharist, that is, the sequence of events, the texts, the symbols are called ‘rites’. In the East, many different rites evolved and these are still in use such as the Coptic, East Syrian, West Syrian, Byzantine and Malabar rites. Several different rites evolved in the West but the Roman Rite is the one used almost universally now. We could safely assume that when the ‘Breaking of Bread’ was begun in Jerusalem, the participants would have used their own language, Aramaic, and the Greek speaking people among them (the Hellenists) would have used Greek. As the gospel spread beyond Israel, the local language of the area was used and people of the Eastern rites still use these languages. In the West the language of the common people, Koine Greek, was used but Latin became the favoured language. Latin prevailed in the West until the Council of Vatican II in the 1960s. This transition from Latin into the vernacular languages for the Mass was a momentous step in the 1960s. I wonder whether there was as much trauma in the change from Greek to Latin in the late second century as there was in the recent change from Latin to English! Jews had rules for fasting and the early Christians continued this practice by fasting from midnight until the celebration of the Eucharist. Fasting meant nothing to eat and nothing to drink, not even water – a very difficult practice, especially for priests in hot countries like Australia when they frequently had to travel long distances between Masses on horseback. This obligation was only relaxed after Vatican II. Today the fasting is one hour prior to the time of receiving communion. Because Christianity has its roots in Judaism, it was natural for the early prayers to be adaptations of Jewish blessings and prayers. The prayers we use now at the presentation of the bread and wine clearly show their Jewish origin with the opening line, ‘Blessed are you Lord, God of all creation’. Likewise, it would have been natural for the early Christians to continue the practice of reading the scriptures at their gatherings. To this practice was added the reading of the letters of the founders of their communities: Paul, Peter, John and others. We now call this the liturgy of the word. One of the major concerns of the early Church was for the Eucharist to be a sign of unity, especially when persecution threatened to divide the assembly. Eating from the same loaf, drinking from the same cup, gathered around the same table – these were symbols of a united people. This sense of belonging is still very important today. In the early Church, unity with previous assemblies and with congregations in different parts of the city was considered important. In Rome the pope placed a piece of the bread from a previous Mass into the cup at the Breaking of the Bread to symbolise unity with earlier gatherings, and pieces of bread from the pope’s Mass were taken to other churches in the city where the ‘Breaking of Bread’ was being celebrated.. Readings from Old and New Testament ‘for as long as time permits’. The president of the assembly gives a homily. The president ‘offers prayers and thanksgivings according to his ability’. Communion taken to the sick and the absent. Collection for those in need. When Justin says the president ‘offers prayers and thanksgivings according to his ability’, he is referring to the Eucharistic prayer which the presider composed spontaneously as there was nothing fixed in writing at that time–a very significant difference between Mass then and Mass today. Apart from this concession to spontaneity, note how closely the Eucharist at the time of Justin Martyr corresponds to the present-day Eucharist. See also the importance given to taking communion to those unable to be present to let them know they are not forgotten by the assembly – again the concern for unity. Notice also the differences. What is missing is the introduction, penitential rite, opening prayer, the creed, prayer over the gifts, prayer after communion and the dismissal. These were added in later centuries. We take for granted that in every Eucharist we hear the story of the Last Supper which contains the words of Jesus, ‘Take and eat, this is my body given up for you…. Take and drink, this is my blood poured out for you.’ We refer to these as the ‘words of consecration’. In the missal they are printed in bold type and bells and incense were used. These words were considered absolutely essential. However, research shows that the earliest Eucharistic prayers did not contain the story of the Last Supper, hence they did not contain what we call ‘the words of consecration’. In the early Church the Last Supper story with the ‘words of consecration’ was not part of the liturgy. The focus of Taft’s article is the Eucharistic prayer of Addai and Mari used in the Assyrian Church of the East and which does not contain the story of the Last Supper, hence it does not have the ‘words of consecration’. He refers to an ‘audacious agreement’ between the Assyrian Church and the Vatican in which the Holy See states that Catholics of the Chaldean Church may receive communion in the Assyrian Church when the Eucharistic prayer of Addai and Mari is used even though the ‘words of consecration’ are not there. This document (Guidelines for Admission to the Eucharist between the Chaldean Church and the Assyrian Church of the East) was approved by Pope John Paul II and promulgated on 26 October 2001. Its aim is to enable the faithful of the two ‘Sister Churches’ to receive the benefits of the Eucharist when their own ministers are not available. Catholics have grown up with the idea that it is at the moment when ‘the words of consecration’ are pronounced that the bread and wine become the body and blood of Christ. In the early Church, however, the whole of the Eucharistic prayer was considered to be the words of consecration, there was no one instant that was singled out as themoment. Thus the early Church did not think of the consecration as ‘consecration by formula’ or of ‘the moment of consecration’. This has important implications for our understanding of the presence of Christ in the bread and wine as we shall see in Chapter 8, Abiding Presence. It may not have been a major preoccupation then, but it certainly is now as controversy rages fiercely over the ordination of married men and of women. Married men were allowed to be ordained in the Western Church up until the eleventh century. In the early centuries ordinary bread which has yeast to make it rise was used for the Eucharist. The gifts that were brought to the altar to be given to the poor included bread, and some of this ordinary bread was used in the Mass. In Jewish practice, unleavened bread was known as “bread of affliction” but the early Christians wanted to celebrate the memorial of Jesus’ death and resurrection as a joyful event so unleavened bread was not appropriate. They drew on the sacrifice of todah for their inspiration. This was a sacrifice offered when death seemed to be inevitable due to sickness or danger. Meat, leavened bread and unleavened bread were offered in thanksgiving when the person’s life was spared. Gradually this sacrifice moved away from the temple into homes and was celebrated with leavened bread and wine. Rabbis predicted that this sacrifice would continue into the life to come whereas other sacrifices would not. The practice of using leavened bread continued for 800 years. Then because of an upsurge of interest in the sacrifices and priesthood of the Old Testament (forgetting about the sacrifice of todah), unleavened bread began to be used. It was also found that left over leavened bread didn’t keep well. Another influence was that the Germanic tribes which had been converted to Christianity picked up the Arian heresy which said that Jesus was not divine. The church reacted to this aberration by stressing that Jesus was not only God but that he was the judge of all humankind, and a severe judge at that. People then felt they should not touch this divine presence in the host, so receiving on the tongue became the norm, a practice that has lasted till the present day. It’s a universal human urge to sing, so we can be sure there was singing during the Eucharist in the early Church. Singing gives colour to a ceremony, touches the heart and allows the right side of the brain to come into play. Over the centuries, customs and regulations about singing have varied. Gregorian chant, the free-flowing music without a time signature or regular beat, ruled for hundreds of years, especially in monasteries. Gregorian chant is surely one of the most beautiful creations of the human genius and was designed for the Latin language. The simple chants of the early centuries were very beautiful and quite suitable for the people to sing. However, as chant developed in length and complexity, only trained choirs could sing them. Polyphony (part singing) also developed to an extraordinarily high art form. The model being used for Church music, consciously or unconsciously, was that only the very best was good enough for the worship of the all-holy God. However, this meant the people in the pews became listeners, not participants. 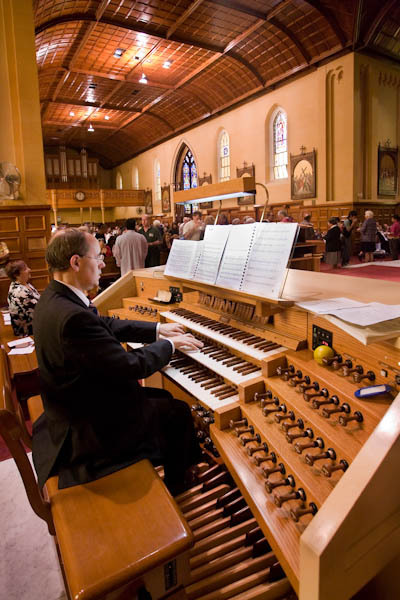 When Vatican II asked for more participation by the people, a new form of music was introduced: more singable, based on scripture and accompanied by guitars and other instruments in common use. Along with other lovers of fine music, I was not impressed. But I had a conversion. At a family gathering an aunt and an uncle spoke enthusiastically about how they could now join in the singing at Mass. I thought, ‘If this music gets ordinary people like Auntie Pat and Uncle Bob to sing at Mass, it has a lot going for it.’ However, Gregorian chant and polyphony still have a valuable niche to fill in Church music, and I have a great love for the dark but deeply spiritual music of the Eastern Churches. An important development was the movement from the ‘home Mass’ of the very early Church to the Eucharist of the larger public buildings called ‘basilicas’ once the emperor Constantine issued an Edict of Toleration for all faiths in 313 and Theodosius declared Christianity as the state religion in 381. The large basilicas allowed for processions for the entrance of the ministers and for bringing up the gifts. Sunday became a holiday, giving more time for Christians to celebrate. Liturgies became longer and more elaborate. Feast days to commemorate the martyrs and other significant Christians were introduced. This led eventually to daily Mass. A most regrettable development then occurred, one that would drastically change the Eucharist for over a thousand years and lead to a serious misunderstanding of the Eucharist. Not receiving the bread and wine was an extremely serious loss of peoples’ participation in the mysteries, in some ways a denial of what the Mass is all about. By the thirteenth century the reception of communion had become so rare that the Church made a law that everyone must receive communion at least once a year. That such a law should be necessary indicates how poorly the Eucharist was understood at that time. Another development occurred with the priest having his back to the people. When churches were custom built for Mass the altar was placed at the western end so the priest could face the east which was symbolic of the risen Christ. In doing so he faced the people who were on the other side of the altar to him, facing west. Around the eighth century the altar was moved to the eastern end of the church but the priest still faced east which meant he now had his back to the people. The priest’s back prevented the people seeing what he was doing at the altar. The people now just looked on while the priest ‘said the Mass’. One of the most significant changes that were made following Vatican II was to again have the priest facing the people, enabling the congregation to feel they are participating more fully in the Eucharist, and the altar again became a free-standing table instead of a bench against the wall. In the early Church it was clearly understood that the Eucharistic celebration was a powerful movement of transformation from dying to rising by remembering the death and resurrection of Jesus. 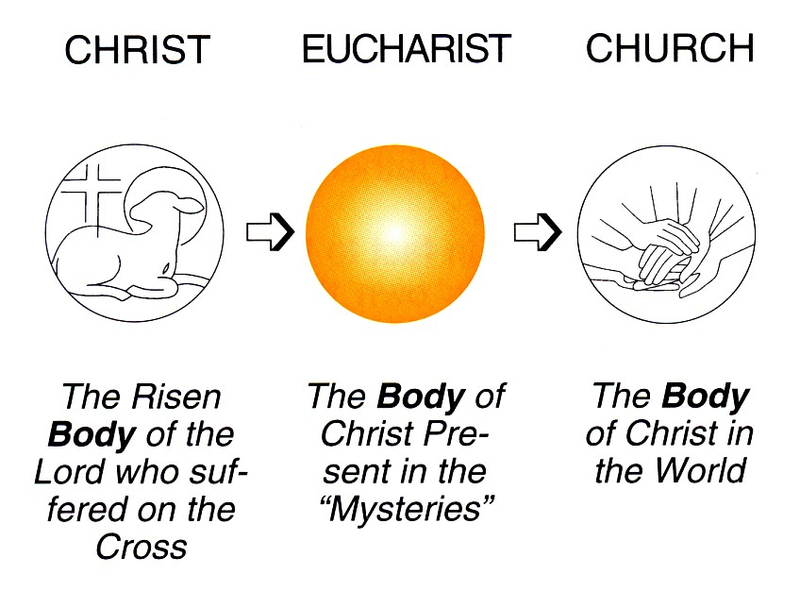 By participating actively in the Eucharist, the people were transformed through the same dying and rising process. We can illustrate this in the following diagram. We could rework the above diagram using the word ‘body’ to link the three images. The Eucharist is the connecting link between the risen Christ and the Church. It is by means of the celebration that the dying and rising of Jesus produces the evangelising Church. This was achieved in the early centuries because the Eucharist focussed on the twin events of the dying and rising of Jesus and the faithful participated fully in the Eucharist. Alas, this model crashed during the Middle Ages! During the Middle Ages, Jesus’ suffering and dying became the focus of the spirituality of the faithful while the resurrection was neglected. In fact, the Easter Vigil, the most important ritual of the whole liturgical calendar, was dropped altogether. The principal focus of the Eucharist came to be seen as making the bread and wine into the ‘real presence’ of Christ which took place at the moment the ‘words of consecration’ were uttered. 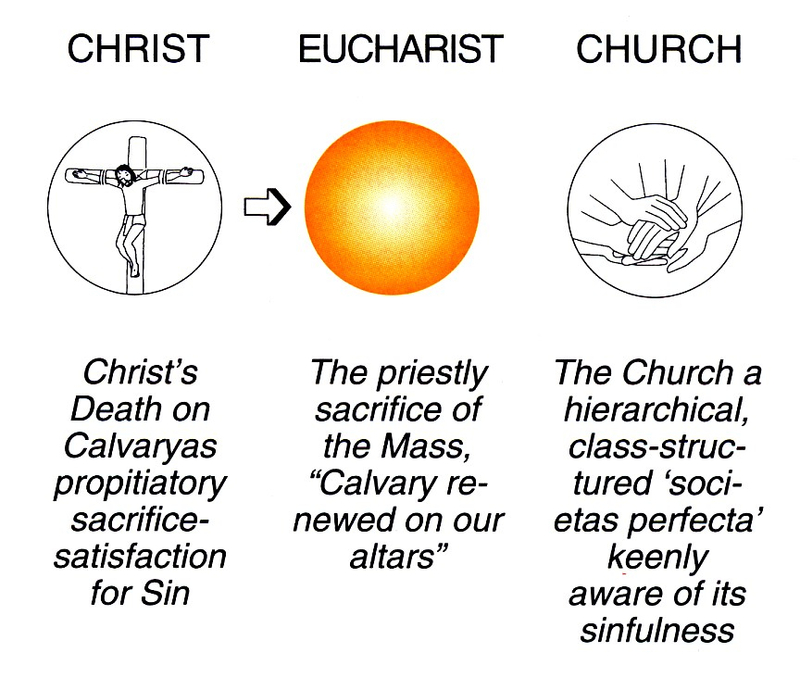 The dynamism of the Eucharist that we saw in the first model was completely stalled. It was considered the Mass fulfilled its function by bringing Christ onto the altar. The arrow link between the Eucharist and the Church was removed. Instead of the Eucharist being seen as an upward movement of praise and thanks to God for his love and his gifts, the Eucharist was seen as a downward movement of Christ onto the altar as a sacrifice to expiate the sins of humankind. An emphasis on the presence of Christ in the bread and wine led to devotions such as Exposition of the Blessed Sacrament, Benediction, visits to the Blessed Sacrament and the Forty Hours. These are all good in themselves but they became substitutes for receiving communion. An extraordinary devotion for offering Mass for the release of the souls in purgatory grew to such an extent that at the Cologne cathedral a hundred priests spent the whole day celebrating Masses for the dead! Sometimes Masses were celebrated by the priest alone. This was considered acceptable because the Mass was making propitiation for the sins of humankind and appeasing God’s wrath whether the people were present or not. With his back to the people, the priest had to hold the host and chalice up high so they could be seen and adored. It was believed that extraordinary graces would be given when they were thus seen, and to ensure people didn’t miss the moment, bells were rung and incense used. People would sometimes call out, “Hold it higher, priest.” Some were so keen on this practice they would run from one church to another just to be there for the moment of consecration! I can remember very clearly all of these practices some of which still linger. The result was the people were alienated and moved to the role of spectators while the priest performed every function for them but not with them. By the beginning of the sixteenth century a movement for reform began to take hold. This culminated in the new missal of Pope Pius V in 1570 and became the standard for the Western Church. Pius V made full use of the understanding of the early Church in so far as it was known at that time. In his missal there was only one Eucharistic prayer called the Roman Canon, now known as Eucharistic Prayer 1. The Roman Canon was generally considered to be unchangeable. However, in 1962 Pope John XXIII did the unthinkable – he added the name of Joseph, husband of Mary, to the Roman Canon. This may seem to us now as something fairly trivial but at the time it was considered as revolutionary because the pope had done what had been considered unchangeable, in spite of the fact that some modifications had been made in 1604, 1634 and 1914. Since the reform of 1570, a lot more was discovered about the Eucharist of the early Church and this enabled Vatican II to restore the liturgy more accurately to the traditions that had been lost. Change began with the restoration of the Easter vigil ceremonies in the 1950s and made a mighty leap forward with the reforms of the Council of Vatican II in the 1960s. We are so fortunate to be living at this time in history when we can enjoy the fruits of research and reform! Our spirituality is enormously enriched by the rediscovery and implementation of the genuine traditions of the early Church. I hope this very brief account of how the Eucharist evolved over the centuries will help you to understand much of what follows as we look at the parts of the Mass and the themes that flow from it.